1-click BOM is a browser extension that fills your shopping carts for you on sites like Digikey and Mouser. Its main purpose is to work with the electronic project sharing site kitspace.org. But you can also use it from a spreadsheet or load an online .tsv file from any other site. Check out our electronics sharing site: Kitspace! Check the roadmap for more details on planned features. In the schematic window, select "File -> Export -> BOM". 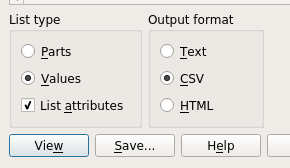 Select "List Type" values and "Output Format" CSV (see image) and press save. Open the .csv in a spreadsheet program (LibreOffice, Excel). Select a semi-colon seperator when importing. Adjust the description column to be more informative, e.g. "10uf 0603 X7R" for a capcitor or "1k 0805" for a resistor or the MPN for ICs and transistors. The description will be used for auto-completing. 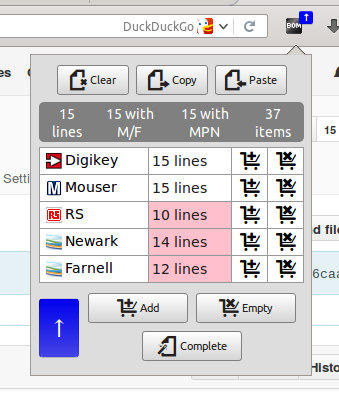 Select everything in your spreadsheet program, copy and paste into the extension. Press "complete" in the extension, wait till it's done and then press copy. Open a new spreadsheet and paste into it. Save it as tab-seperated values, with a .tsv extension and UTF-8 encoding. Check over all the part numbers and make sure they are correct. Put them into your shopping cart using the extension to confirm they have the right minimum order quantity etc. Download the Python files from the output_scripts/kicad directory. Put them all together into a directory where you want to keep them. 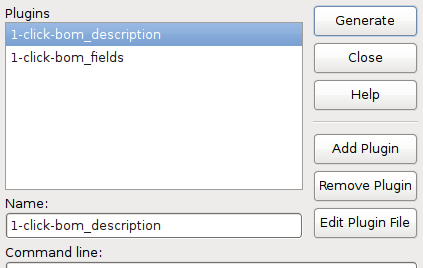 1-click-bom_fields.py if you have fields in your symbols that 1-click BOM will understand (see below). Open the resulting file in a spreadsheet program or text editor. Reduce the descriptions down to the bare minimum if you want to use auto-completing. Copy and paste it into the extension. Try auto-completing in the extension if you wish, check all the values afterwards. To sync any changes back into your schematic you can use KiField. You can copy and paste into the extension from a text editor or spread sheet program (LibreOffice, Excel). You must have a column for references, one for the quantity and at least one of: decription, part number or a retailer column. You can have multiple part number columns for specifying multiple possible manufacturer part numbers per schematic reference. When saving files from your external editor or spreadsheet save them as tab-seperated values with a .tsv extension with UTF-8 encoding. You can find this and other examples in TSV format in the examples directory. If you visit a page on kitspace.org or one that ends in .tsv and has data in the right format available 1clickBOM will show a blue badge and button with an arrow. Clicking the blue button will load the data into the extension. Once the data is added you can use 1clickBOM to add the items to your carts using the buttons on the popup. You can also quickly view and empty your carts. 1-click BOM can try and complete an incomplete BOM for you by selecting resistors and capacitors from the CPL and searching Octopart and Findchips. A complete BOM is where every part has a manufacturer part number and a part number for every retailer. Simply press the button labeled 'Complete' and 1clickBOM will use other fields to search for the fields that are left blank. You should always check over the parts it has selected for you. Auto-completion works best if you have limited text in the description. Try and reduce the description column down to the bare-minimum or add an MPN field. "1uF 0603 X5R" is a good description while "C Capacitor 1uF 1 micro Farad SM0603 0603 SMD" isn't. or visit the Kitspace chat room. The rest of the dependencies can be retrieved via npm install. Most of the tests are functional tests that require interaction with the various retailer sites and they make a lot of network requests to test across all the different possible locations. Sometimes they will fail because they are not an accurate representation of actual extension use. If a test fails or doesn't complete, run it again before investigating. Try and re-create the issue manually before trying to fix it. 1clickBOM is free and open source software. It is licensed under a CPAL license which means you are free to use the code in your own applications (even proprietary ones) as long as you display appropriate attribution and share your code-improvements to 1clickBOM itself under the CPAL as well. This also applies to software you are solely making available to users over a network i.e. software as a service. See the LICENSE file for details.